Who wants ice cream?! - In this series of blog posts we are going to develop a small web application called "Gelary" using HERE maps and services. Gelary aims to disrupt the ice-cream market by enabling ice-cream producers to deliver their sweet goods directly to their customers, wherever they are. The final application will resemble a mobile dashboard view for the employees of our little start-up which they can either take on the road or use at Gelary HQ to plan their work. It will consist of a map and a floating control panel behind a menu button. The map is used to visualise a route, starting from the user's current position along a series of customers, and the traffic situation along the route. The control panel will enable our delivery drivers to search for nearby ice cream shops, display turn-by-turn directions as well as to calculate the best pick-up location for a group of selected customers. The app will also be able to handle order changes: e.g. if a customer cancels or updates his or her position, the route will automatically be recalculated. In the previous post we've learned how to request the user's physical location via his or her web browser's geolocation API and update the map accordingly. If you haven't read it - we'd recommend to check it out before moving on. Now it's time to jump into the deep end and get familiar with the routing API. We will start by calculating a route between two locations and draw the result as polyline onto our map. - Ready? Let's dive right in! In this example we're also able to utilise our platform instance to access the routing service by calling getRoutingService(). Yon can find more information on the routing API in the documentation. The RoutingService object provides two methods - configure and calculateRoute, the latter being the method we're primarily interested in here. Let's take a closer look! calculateRouteParams An object containing search parameters required to query the HERE API for a route, including a list of waypoints and the desired routing mode. onSuccess Callback triggered once a route has been successfully returned from HERE’s service. onError Callback for the case that the request wasn’t completed successfully. To request a simple route we must first define a start and end point. This information will be passed as WayPointParameterType objects (more information in the documentation). We also need to decide on a routing mode. As our delivery drivers are experts and ice cream doesn't like to stay in the sun too long, let's go with fastest;car in this case. Additionally we use the representation key to define that the response shall be formatted for the use with our map by setting it to display. Awesome! We're a good step closer to getting our route printed onto the map. Let's keep going! Keeping our code clean is key to a maintainable codebase. So let's give the routing functionality a bit of structure and move it into it's own file called route.js, located in the scripts folder. To make things even cleaner, let's also structure our code a bit better. Inside our new route.js we will define a single function called HERERoute hich will take the map and platform objects as parameters. A lot cleaner but the outcome hasn't really changed. Let's do something a bit more interesting, shall we? First we have to check whether the request has actually returned a route at all. Assuming that's the case we will have to decide which routing option we want to use, as the API will return several routes. For simplicity's sake we'll use the first result. We still need do to a bit formatting nonetheless and we'll use one of our data types for that purpose. H.geo.Strip is an ordered, flat list of latitude and longitude pairs - perfect for us! The time has come! Go and refresh your browser window and you should see a big, fat, blue route rendered onto your map. Well done! In the previous post of this series we've requested the user's geolocation and then placed a marker accordingly on the map. Let's use our current location as the origin for our route and place a marker. Next we request the user's current location using navigator.watchPosition. For now we'll set a flag called isRouteRendered to ensure that the route is only rendered the first time - we will implement a more sophisticated solution later. 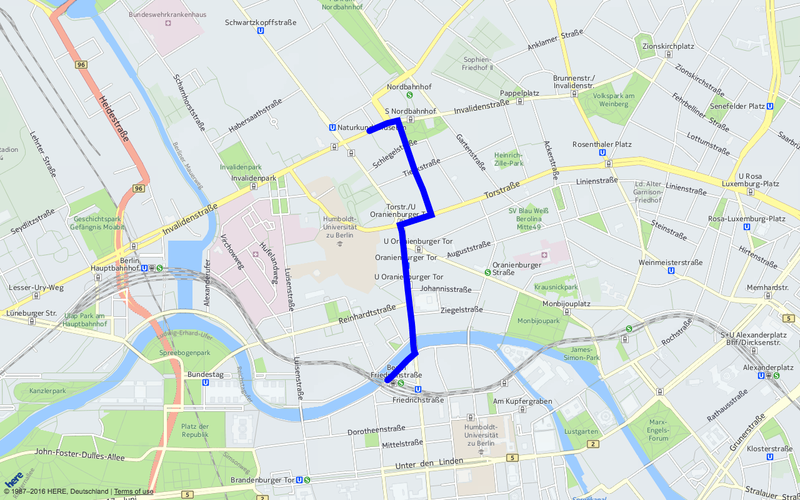 Refresh your browser once more and there you have it - a route calculated from your current position to HERE's HQ in Berlin. Nicely done! Today we have learned to request routing information for two locations and render the result onto our map. In the next post we are going to start with some more refactoring and then take a closer look at some more advanced routing features of the HERE APIs. Stay tuned!